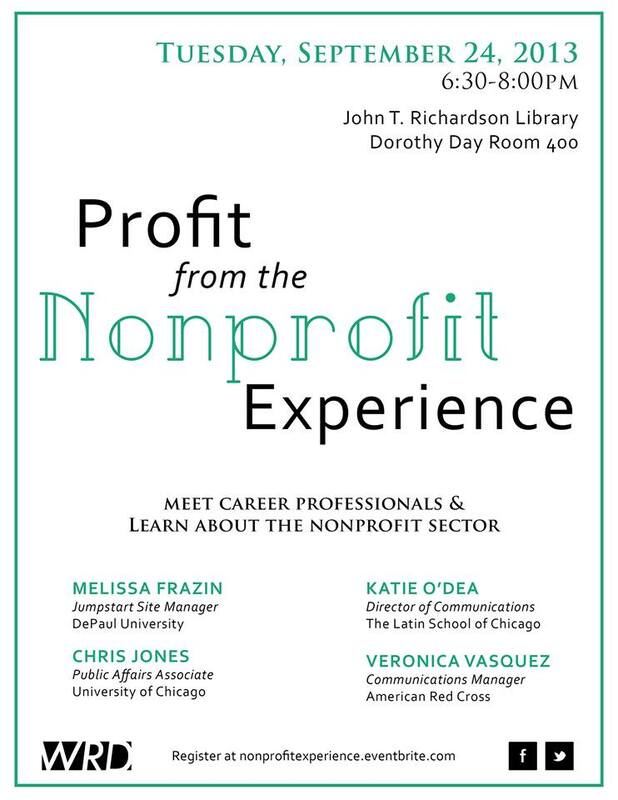 I recently attended a career event at DePaul University, during which four nonprofit professionals shared job responsibilities and advice. Each had unique perspective, but there were consistencies in the experiences and skills needed to be successful as a nonprofit professional. One of the event speakers detailed how she tracked people down at conferences and arranged informational interviews with those in positions of interest. She referred to her efforts as a bit ‘stalkerish,’ but more importantly, they were effective. Keeping in mind the screen comfort discussed last week, be sure that you are ready to sell yourself and ask the right questions during a face-to-face conversation – your ultimate goal. While being able to serve other purposes – graphic design, web development, etc. – is a big plus, remember the importance of your primary role as communicator. Your day will be dominated by writing, and therefore, demonstrating strong writing skills will set you apart from the pack of applicants. One event speaker continually returned to the importance of keeping his portfolio up to date to continue opening doors. Technology is altering the way we communicate with our audiences. The rapid introduction of new platforms and devices means that we need to be constantly assessing impacts and uses of technology. Calling back to that limited resources statement, this may be self directed research and learning. Do not take this task lightly – you may need to present your findings to those in charge of budgeting. I have never worked for a nonprofit but find that the list above applies to my role as well. Smaller companies and/or teams allow for the same ‘multiple hats’ responsibilities and benefits so do not let an interest in the above list deter you from corporate. However, references to standard working hours and more vacation time at nonprofits may sway you back in that direction. Calling all nonprofit professionals, what do you think?